President Hugo Chavez—perhaps more than any other Latin American politician—sought to build bridges with the Caribbean, to unite two regions which have so much in common, but for far too long remained divided by the entrenched legacies of colonialism. While many other articles have turned to focus on the economic consequences his death might potentially bring to the Caribbean, a remembrance of all that he had done both for and with the region seems more fitting. Since his election in 1999, Chavez always thought in terms of the Latin and Caribbean region as a whole—instead of divided nation states. While the links between Cuba and Venezuela are more readily apparent and obvious, it was not long before Chavez began to forge deep and meaningful relationships with the English and Kreyol speaking Caribbean. By 2009, the Bolivarian Alliance for the Americas (ALBA), which originally consisted of Venezuela and Cuba, had expanded to include the Caribbean islands of Antigua, Dominica, and St. Vincent. This regional alliance is committed to an agenda of poverty eradication, sustainable development, and social justice founded upon the values of co-operation, equality, and solidarity. Furthermore, the regional integration promoted by ALBA importantly stresses policy flexibility, fair trade, and recognition of the unique circumstances faced by the many small Caribbean economies. The creation of the Community of Latin American and Caribbean States (CELAC) in 2011 signified the reorientation of the region away from North American influence. In what was considered by many to be as radical alternative to the Organization of American States (OAS), Canada, and the United States were not granted membership. This show of solidarity between the 33 independent countries of Latin America and the Caribbean signaled that Chavez's decade long push for deeper regional integration was not in vain. Upon the institution of CELAC Chavez remarked that "Celac is born with a new spirit; it is a platform for people's economic, political and social development, which is very different from OAS." Like a true friend, when tragedy arrived, Venezuela was always one of the first nations to offer assistance to the Caribbean—such as when they faced the devastating hurricanes like Ivan in 2004, Tomas in 2010, and Sandy in 2012. In addition to the emergency aid, Venezuela has conducted more sustainable projects in partnership with local governments. For example, Venezuela has helped to construct a hospital in Grenada, an airport expansion in St. Vincent, an oil refinery, and public housing works in Dominica, among other projects (A wikileaked U.S. cable titled E. Caribbean and Venezuelan Foreign Aid: Rhetoric or Reality? highlights many of the projects). In regards to Haiti, Chavez was always conscious of the historical links which bound the two nations together in their struggle against imperialism. When the great liberator of South America, Simon Bolivar was seeking refuge, Haitian President Alexander Petion provided him with a safe haven, in addition to men, money, and arms. It was not lost on Chavez that the tricolor flag of Venezuela was both created and flown for the first time in the Haitian town of Jacmel, resulting in him changing the Venezuela’s Flag Day to March 12 in order to reflect this little known fact. In his visit to Haiti in 2007, Chavez announced plans for a US$80 million oil refinery, a US$56 million electricity plant, a US$4 million liquid gas plant, expansion of the Port-au-Prince and Cap-Haıtien airports for US$57 million, US$3 million for waste collection, and resources for a Cuban health care program in Haiti staffed by 2,000 doctors. After the devastation of the 2010 earthquake, Venezuela quickly cancelled Haiti’s Petro-Caribe debt, with Chavez stating that “Haiti has no debt with Venezuela, just the opposite: Venezuela has a historical debt with that nation, with that people for whom we feel not pity but rather admiration, and we share their faith, their hope.” Venezuela would also go on to pledge $2.4 billion to Haiti’s reconstruction—with $369 million dispersed to projects in 2012. 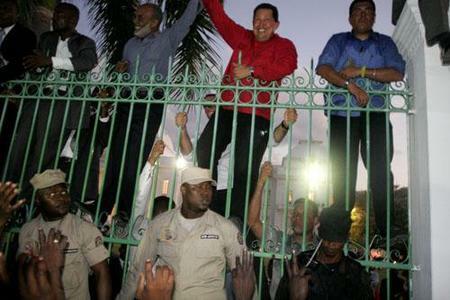 Perhaps the issue of race also played a significant role in helping to bridge the divide, as Chavez did not see himself as a person apart from the people of African descent in the Caribbean, indeed he openly identified as one of them. In 2005 Chavez spoke on the issue of race in Latin America, stating that "Racism is very characteristic of imperialism and capitalism. Hate against me has a lot to do with racism. Because of my big mouth and curly hair. And I'm so proud to have this mouth and this hair, because it is African." It is appropriate that the contributions of Hugo Chavez cannot be summed up in any brief manner, as they extend far beyond what is covered here. The Caribbean, which remains on the periphery of the global economy—abandoned by Europe and the United States when trade preferences and security priorities changed—found a friend in Venezuela and Hugo Chavez. He was not just admired in the region for what he gave, but also for what he represented. This can been seen in all of the condolences offered by the Caribbean leaders on behalf of their people. He refused to be bullied by empires who sought to bring him down by violence and economic destabilization. He sought to build a society upon solidarity, social justice, and reciprocity.